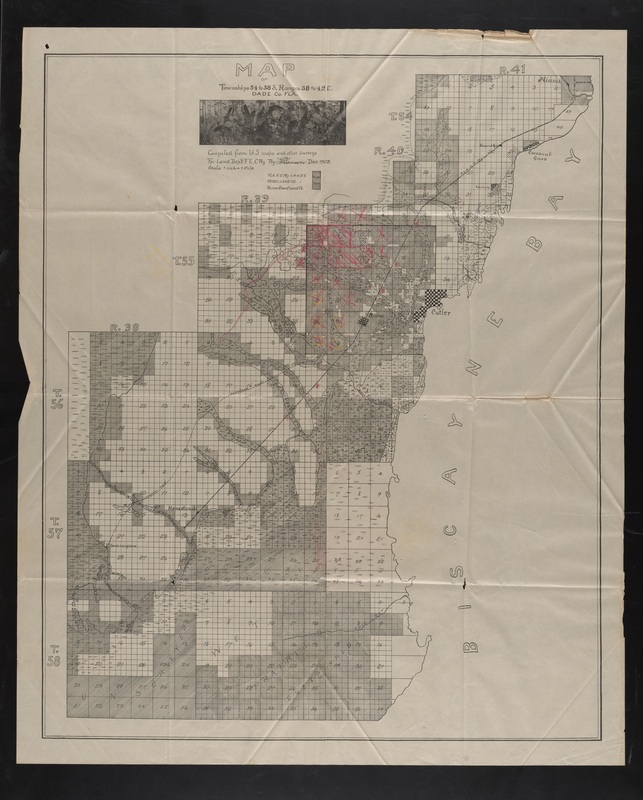 While conducting research in the Model Land Company’s papers at the University of Miami’s J. I. Kislak Archive, I found a very important map of the land holdings of the F.E.C. Railway, the Model Land Co. and the Perrine Land Grant Co., dated December, 1903. The Kislak Archive scanned it for me for a very reasonable price and I am now sharing it with the public. It shows the route of what was then called the Cutler Extension down to Homestead, continuing a short distance past Homestead in a straight southwesterly direction. William J. Krome, who started his survey to Cape Sable earlier in that month, did not complete his work until June of 1904. He concluded that it was not economically feasible to build the railroad down to Cape Sable and then over Florida Bay to Key West. At the time this map was drawn, Flagler still planned to go to Cape Sable. This is a large file, so be patient while it downloads. David Torcise, who created the Google Earth Map of Homesteads, was so intrigued with the map he created another layer which shows the land holdings of the F.E.C. Railway correspond to the land he showed as belonging to the Key West, Jacksonville & Tampa Railway. That company went bankrupt in 1893 and its holdings south of Titusville were sold to Flagler in 1899. At the time David created his overlay, he did not have any information about the holdings of the F.E.C. in Dade County. If you would like to download David’s latest creation, click on this link. I transcribed this article from the October 17, 1918 issue of The Homestead Enterprise and added links and footnotes to explain some of the events mentioned in the article. Dan Roberts married Annie Margaret Fitzpatrick, the daughter of Byrd and Alice L. Fitzpatrick on September 22, 1906. She was the sister-in-law of Annie Mayhew Fitzpatrick, the well-known musician and writer of poetry and non-fiction. Dan was born on January 2, 1876 in Lake City, FL and filed for his homestead on Coconut Palm Drive and S.W. 182 Avenue on April 27, 1900. He was a prominent nurseryman and well-respected horticulturalist who established the Mason & Roberts Nursery as early as 1907 with his brother-in-law, Benjamin Mason1. Early in 1911, the name was changed to The Homestead Nurseries Co., which was apparently later purchased by William H. Cauley and renamed the Dade County Nurseries Co., Inc. Roberts later established his own nursery, the Roberts Nurseries, and ran that business until at least mid-1925. Dan was a founding member of the Board of Directors of the Bank of Homestead in 1912 and served in that capacity until at least 1926. Roberts Road, S.W. 182 Avenue, is named for him. In the spring of 1898 I left Volusia county from a point on Lake George in company with a fellow by the name of Claude Jenkins. We had heard of the Homestead country as a land famous for good hunting and it was said that the soil was red similar to that of Cuba.2 We were both very fond of hunting and camping in the woods so the idea struck us so hard that we both decided to quituate (sic) from school and do some exploring. Our plans were to take a boat with a separable sail and follow the St. Johns River from Lake George across the Blue Cypress and Allapattah Flats west of Ft. Pierce and enter the Everglades at the north end, pass through Lake Okeechobee and finally land up on the Indian canoe trails along about Miami or Cutler. It was also in our plans to look the Homestead country over and then go to Cuba as we were tired of trying to raise groves and nurseries in Volusia on account of the freezes. However, our plans could not be carried out for as we reached Lake Winder after following the curves of the St. Johns river for a couple of hundred miles to a point about west of Rock Ledge or a little southwest of Cocoa, the river suddenly ended in a vast bonnet bed as far in every direction as you could see. The weather was extremely dry and stayed so for five months after we reached this point. There was not enough water in the bonnet bed to float a match and the large roots ran along the surface like palmetto roots, making it impossible to pull a boat through it as a man could get no toe-hold except on the bonnet reeds and when his feet slipped he would go out of sight in the mud. We decided to wait for rain but in the meantime we had to make a living so we fell to killing ‘gators for their skins and after five months stay we had killed six hundred of these reptiles 3 and sold their peelings to buyers at Cocoa. The skins brought us on average about 75 cents apiece. We had some terrible fights with some of the larger specimens. Most of the hunting was done at night along the river with a bullseye lantern which we took by turns and were on our heads to find the gators by shining it in their eyes and shooting them with a rifle. One night my partner made a poor shot on a monster and then broke the rule by not chopping him on the head with an axe when he dragged him into the boat. He said it was no use to chop him as it was only a little ways to the camp and we were homeward bound then, but only after a moment the gator was scratching on the bottom of the boat and I asked my partner to shine the light back; that this gator is coming to life. The partner turned the bullseye around on the gator and as soon as he did the gator got on his feet, turned around and made for him with all his might, with his mouth open wide enough to have swallowed him whole. The partner could not shoot for fear of either killing me or shooting a hole in the bottom of the boat. There was little time to think of anything so he backed off over the bow of the boat in 20 feet of water and the big gator went right in after him. The partner soon came to the top, lantern out and the gun gone to the bottom. The old gator was cutting up jack snorting and swallowing the water with his tail near the boat and between spells of laughter (from me, not from the partner) I finally paddled the boat to the shore, which was only a few feet away. Next day we went back and had a diving match for the gun and recovered it after about an hour. After five months of this kind of work we decided that we had had enough of the gator business and sold our boat to a hunter on Lake Poinsetta, west of Cocoa. We then took the steam boat on Indian River and came down to West Palm Beach, reaching there sometime in the fall. Palm Beach was then in Dade county. My partner got a job at a milk dairy near Palm Beach and I planted a farm on shares with a land owner near Palm Beach. The farm froze out so it looked as if Jack Frost was after me. My partner, like myself, was ready to move again, so we planned another exploring trip. This time we would take a small boat with a separable sail and go down the Lake Worth canals to Biscayne Bay, stop at Cutler and look over the Homestead country and if things did not suit us we would go to Cuba. After exploring in the Homestead country for a couple of years and killing many deer we both decided to enter claims adjoining. So, the partner entered the claim that W. H. Cast lives on now and I am still living on mine. When the Homestead exploration was planned there were two others joined us at Palm Beach. These were P. L. Jenkins 4 and Jim Prevatt. When we started out from Cutler we were told to put on our worst shoes as the rocks would ruin good shoes. We didn’t know any better than to do this, with the result that when we reached our first night’s camping place about 12 or 15 miles out we were all practically barefooted. We made our first night’s camp out in front of John Brinsell’s house and he told us a lot of things about this kind of rock being a gold-bearing rock and signs of pirates having their headquarters here in years past. Our young friend Prevatt lay with his head on a palmetto root and listened to Mr. Brinsell’s yarns about the rock. Among other things Mr. Brinsell said rock if pulverized would make good fertilizer and to this Prevatt said he knew a way better than that, which was to put the rocks in a pot and boil them until they were soft and then pour them along the rows for fertilizer. The next morning Prevatt deserted us and I have never seen him since, but in the next two or three days we went back to Cutler and found a note from him saying that we could have his interest in the boats and other things there; that he had gone back to Palm Beach. At this time Brinsell 5 was the only man living on his claim. This was the same claim bought by L. R. Nixon and is located immediately south of the Baptist church at Silver Palm. Mr. Brinsell’s business was to locate newcomers on claims and he charged $10 for this. There had been a great number of claims entered before I came down here but none of them, except Mr. Brinsell, lived on them. 6 Finally, Charley Gossman, Will Anderson, C. W. Hill and possibly a few others came out and took up permanent residence on their claims. Not many years after this there was a great rush of people entering claims on the mistaken idea of proving up by visiting the claim once in six months. Numbers of people from Miami had entered claims, all hands and the cook, while a large part of them had never seen the land and never expected to except to guess when he was on it and camp one night out of each six months. About this time the government sent down a very shrewd man by the name of Stanford for the purpose of making a tour of the country to ascertain who was complying with the law and who was not. This man never approached the defendant in the case but went to talk to everybody else to ask questions about him, so that there was no way of getting around him. When he left this country, he carried away the hopes of many would-be homesteaders. A few parties were fined for their manner of proving up, others had to buy their land with script, while the majority abandoned their claims without any effort to prove up. During this rush I made considerable money building log cabins for the would-be homesteaders. I probably built a hundred, scattered all over this country, all of which have been destroyed by woods fires years back. About the time of the government clean-up, those who were left began to make some improvements on their places and I got practically all this work. I cleared and planted on acre in grove for Chap Brown 7, on the place where Mr. Capello 8 lives at present. I also cleared and planted at the same time a two-acre grove for Isaac Brown 9 on the place where Mr. Miller 10 lives now. These were the first groves planted in the country. There were scattered trees all over the country about the shacks but the first grapefruit tree to bear fruit was in the Chap Brown grove. The little tree bore 18 fruit with a silvery white skin and many home-seekers would pass along and look at it. As time went on people moved in rapidly and it finally got to where there were real strangers living here, which was something new to my mind and had to be reckoned with; the idea that there could be a stranger in the Homestead country. About the time the railroad started from Miami people poured in from all directions, until I finally got used to seeing strangers. Almost all the old timers are still living around here and it is noteworthy that they all have the greatest confidence and trust in each other. In January, 1903, construction started at the south side of the Miami River on what was then called the Cutler Extension of the Florida East Coast Railway. The route was surveyed by John S. Frederick, who platted the Town of Homestead in June of 1904. After the railroad reached Homestead, the name was changed to the Homestead Extension. Much of the land east of the limestone ridge that separates the Everglades from the coastal plain south of Miami had been given to the Florida East Coast Railway by the State of Florida as part of its incentive for Henry Flagler to build his railroad. A portion of that land in the area of Goulds is shown, either cross-hatched or with diagonal lines through the sections, on the map below. After the railroad reached Homestead in late August, 1904, farmers who had not been able to file a homestead claim started eyeing what William J. Krome had called the “front prairie” in these areas – the low-lying marl soil east of the limestone ridge. Unlike the pine rockland, there were few trees to cut and the sawgrass could be plowed under with tractors. Once the land was cleared of vegetation, farmers were able to raise abundant crops of tomatoes and other vegetables. Thomas J. Peters, among others, had already been farming the “Cutler prairie” and the word had spread about the opportunities to become rich by farming these lands. As I wrote in my post about Franjo Road, John Ehrehart purchased substantial acreage below Cutler from the Model Land Company, Flagler’s real estate holding company, as early as 1908. John C. Baile had done the same in the area east of Goulds as early as 1909. The Tatum Bros. had purchased thousands of acres from the Model Land Company in 1910 east of Detroit, now known as Florida City. Dr. William S. Burkhardt, from Cincinnati, Ohio, purchased 1,160 acres south of John Ehrehart’s holdings in early 1911. He named his property Seminole Plains. All of this land was called “overflow land” as it was subject to flooding in the summer as water from the Everglades drained into Biscayne Bay via the finger glades that crossed the limestone ridge in numerous places. One of those finger glades was in the area where Silver Palm Drive (S.W. 232 St.) intersects U. S. 1 today. 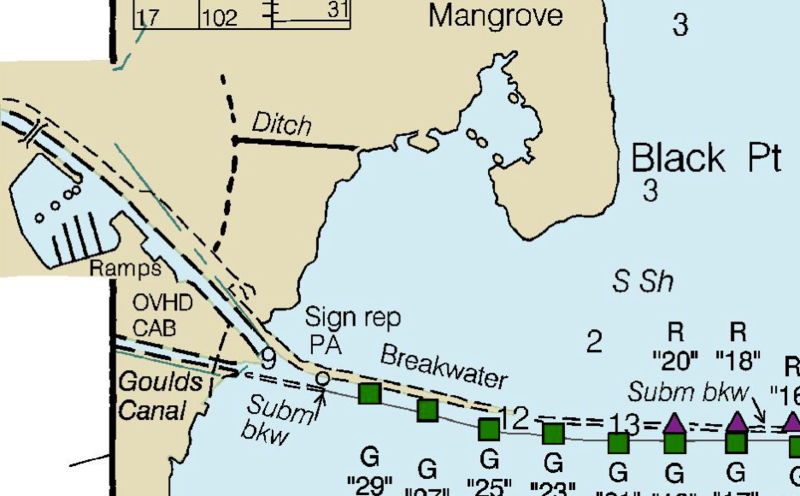 There was a navigable waterway, called Black Point Creek, that ran through this finger glade out to Biscayne Bay, emptying into the bay just west of Black Point. This map, from 1904, shows Black Point Creek. Click on the title beneath the map below to download a version that can be enlarged. This excerpt from a recent NOAA navigation chart shows the Black Point Marina, the east end of the Goulds canal and Black Point. What is labeled as “Ditch” is part of the original canal. 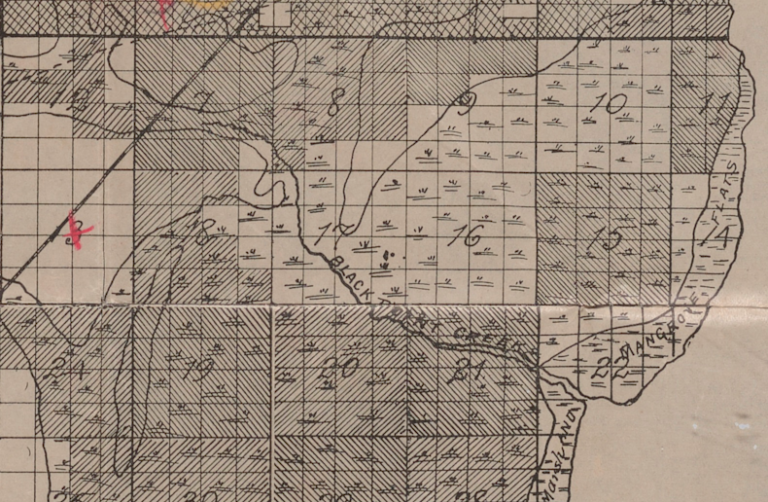 The settlement of Black Point, not to be confused with the geographical feature of Black Point, was on part of the land homesteaded by Henry H. Harrison south of Silver Palm and west of the railroad tracks. The houses in Black Point were largely inhabited by African-American agricultural workers into the late 1940s, if not later. Most of the houses were built by Charles R. Graham, who had purchased his land from Harrison. John C. Baile, as I wrote in my post on Baile’s Road, was the first to attempt to deal with the flooding problem in the overflow lands. He built a system of levees and installed large pumps in an attempt to convert the land to agricultural use. His scheme largely failed and the farmers in the area faced repeated crop failures from flooding. After the canal from Detroit to Biscayne Bay was completed in 1912 by the Miami Land & Development Co., Baile and his fellow investors took note. A heavy rainfall on March 14, 1919 that wiped out 50% of the tomato crop on the front prairie was the event that spurred the creation of the Goulds Special Drainage District No. 1. Nine property owners, including A. Lee Allen, Charles L. Gibbons, William H. Cauley, Richard Ashby and John M. Green, signed a petition to create the district and submitted it to the County Commission on April 11, 1919. John C. Baile, both individually and as president of the Campo Rico Trucking Co., the largest farming operation in the district, also signed the petition. The purpose of the drainage district would be to fund the excavation of “Baile’s Ditch,” as it was called in the newspapers. The district covered about 3,000 acres and was on both sides of what is now S.W. 248th St. from about S.W. 119th Avenue to the Bay. The Model Land Co. owned the majority of the land in the proposed district and hired their good friend, former Gov. William S. Jennings, to lobby against its creation because they would have had to pay additional taxes on their holdings. The County Commission, led by John C. Baile, who was also a Commissioner, prevailed and the District was established. 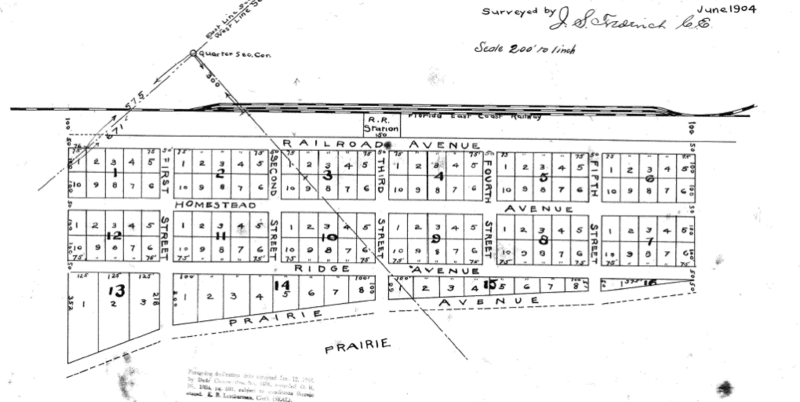 Baile had a friend in Preston H. Lee, who was also the County Commissioner from Goulds and an early homesteader in the area, having filed his homestead claim in October of 1904. The County Commission appointed a committee of three men “to secure an accurate survey of the proposed ditch, drain or canal and establish the point of beginning, route and terminus … [obtain] specifications and profiles for such construction [and estimate] the approximate cost of such improvement and the annual cost of its maintenance” according to an article in The Miami Metropolis on July 11, 1919. Those men were Curtis E. Lee, a brother of Commissioner Preston H. Lee, Charles H. Miller, a homesteader whose land was east of Princeton on Coconut Palm Drive1 and Harley R. Core, a Congregationalist minister who had come to this area in 1911 from Iowa and taken up farming. They hired Biscayne Engineering and one of its employees, Reuben J. Eby, completed the survey. The Goulds Special Drainage District No. 1 sold $52,000 of bonds to the Bank of Biscayne in Miami in late November of 1919 and the contract to dig the canal was formally awarded to the firm of Collins & Holloway on December 17, 1919. 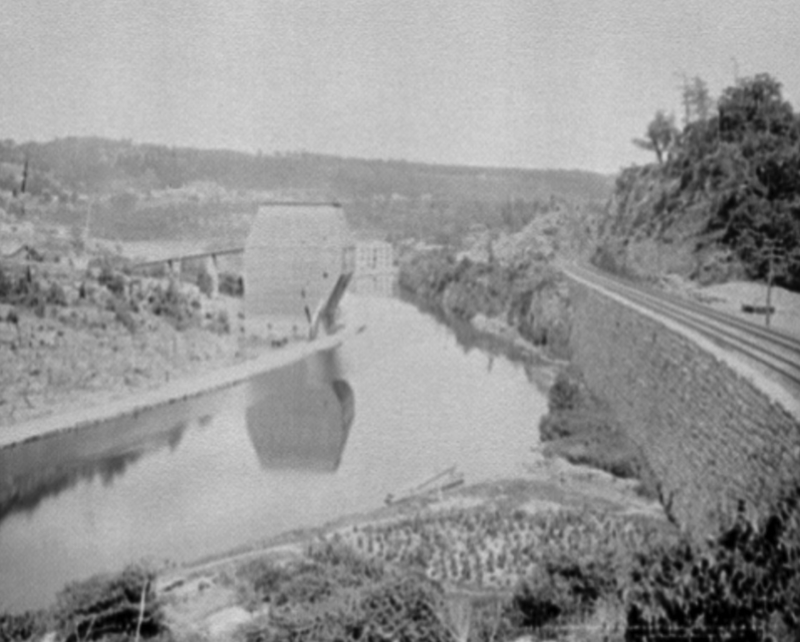 Work was started very shortly thereafter and the canal was finished by late August of 1920. It was initially 24′ wide, 7′ deep and 3.5 miles long. Emmett E. Collins was a dredging contractor, as was Wade H. Holloway. They formed a partnership to bid on the contract but had a falling out shortly after the Goulds Canal was completed. Holloway filed a restraining order against Collins to prevent him from disposing of the firm’s assets. Collins was the contractor who worked on the Detroit Canal (now known as the Florida City Canal) for the Miami Land & Development Co. and Holloway was based in Fort Lauderdale. Holloway went on to do a lot of road and canal work in Canal Point, on Lake Okeechobee. The 1920 census of Goulds and Princeton gives the names of some of the men who worked on the dredge. They were Henry E. Wells, 34, an engineer who was born in Florida; John B. Baker, 65, a laborer born in Georgia; George W. Holloway, 29, a laborer born in Florida and a brother of Wade H.; Harry C. Baughman, 48, a civil engineer born in Ohio and Carl Gulbrandsen, 21, a laborer born in Florida whose parents lived in Perrine. The dredge was likely made by the Bay City Dredge Works in Bay City, Michigan. No photographs of any of the dredging work are known to exist but perhaps some will surface that are owned by a reader of this article. A dredge used in the construction of the Tamiami Trail, made by the Bay City Dredge Works, is in the Collier Seminole State Park near Naples. 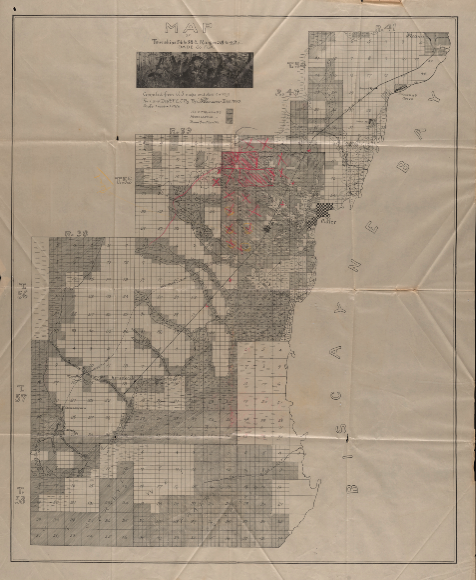 I recently wrote an article about Baile’s Road, which I had always been curious about because it did not follow the rectangular grid of Dade County’s streets and avenues. There is another road in South Dade which does not follow that rectangular grid either: Franjo Road. How did it get its name? John Hill Ehrehart was born on May 24, 1856 in Selinsgrove, Snyder County, Pennsylvania, the first child of the Rev. Charles John Ehrehart and his wife, Martha Elizabeth Hill. His father was a well-to-do Lutheran minister with real estate valued at $8,000 and a personal estate of $2,000 in 1870. Charles was a graduate of the Gettysburg Seminary in 1852, one of the founders of the Shamokin Institute, a public school in Coal Township, Northumberland County, Pennsylvania and the principal of the preparatory department of Pennsylvania College, a Lutheran school, from 1865-1870. It was renamed Gettysburg College in 1921. John Ehrehart graduated with a civil engineering degree from Pennsylvania College in 1874. His first job was as a locating engineer on the portion of the Atchison, Topeka and Santa Fe Railway that passes through Pueblo, Colorado. He then worked on the construction of a spur line of the AT&SF into Socorro, New Mexico in 1880. In 1883, he was in Little Falls, Herkimer County, New York, where he was the locating engineer for the trackage of the New York, West Shore and Buffalo Railway, then being built there. The New York, West Shore and Buffalo Railway was built as a competitor of the New York Central (NYC), owned by William H. Vanderbilt, but it was forced into bankruptcy by them and added to the NYC in 1885. John H. Ehrehart met his wife, the former Frances L. Weeks, in Little Falls and they were married in 1883. He and his wife lived in Piercefield, NY in 1910, where he evidently had been working for the Rome, Watertown and Ogdensburg Railroad, which became a subsidiary of the NYC in 1891. They then moved to New York City, where he became the land purchase agent for the New York Central. He later was promoted to an executive position with the NYC. Because Ehrehart was a consulting engineer for the NYC and had a national reputation, he was very familiar with Henry Flagler’s Florida East Coast Railway Key West Extension, which was started in 1905. In a brief notice that appeared on January 15, 1909 in The Miami Metropolis, it was noted that “Mr. and Mrs. J. H. Ehrhart arrived here yesterday from the Keys where they have been spending several days …” It is possible that he played some role in the construction of the Key West Extension. It is doubtful that this had been his first trip to this area. Some time before 1911, Ehrehart purchased between 400 and 1,700 acres of land just south of Cutler. The number of acres depends on the newspaper account. One from January of 1911 says that he was “the owner of seventeen hundred acres at ‘Black Point’, a fertile tract of red land on the bay shore south of Cutler” while another from April of 1912 says that “J. D. Brown, one of Cutler’s enterprising growers” had “charge of the 400-acre plantation of J. H. Ehrhart, a wealthy New York investor.” Ehrehart also owned “a large peach orchard” in Georgia which Brown managed, too. J. D. Brown’s name was misspelled by the newspaper reporter – it was really James Bedell Brown (1876-1951). He was of some relation to David Chappell Brown, the Brown in the Brown & Moody store in Cutler. The Browns were originally from Camden County, Georgia. According to an article in the January 21, 1911 issue of The Miami Metropolis, Ehrehart named his estate “Franjo.” The origin of the name is probably a contraction of the first names of Frances L. Ehrehart and her husband, John. The article stated that “a fine rock road to Perrine” was being built to “bring the products from the farm much nearer transportation facilities.” That rock road is identified as the “Perrine Road” on the 1924 plat of Tenalla Ocean Farms, recorded in book 8 on page 124 of the Miami-Dade County records. 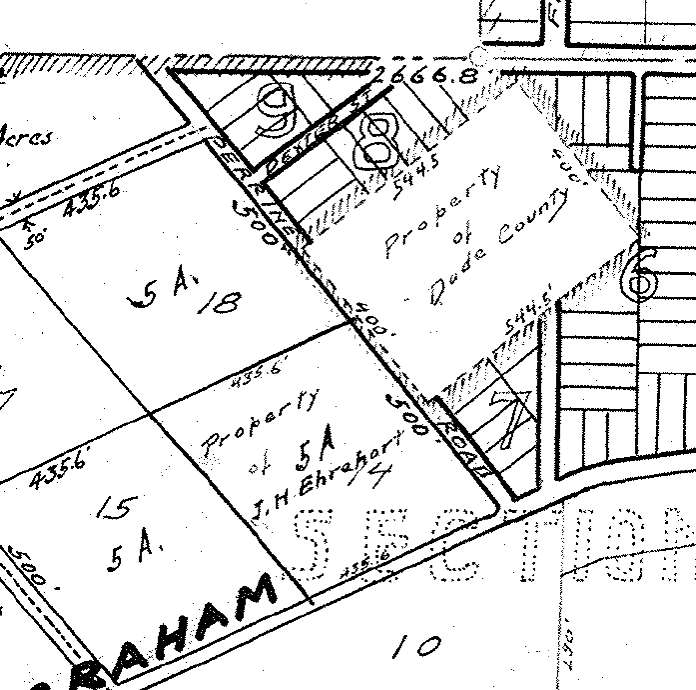 The plat shows the property of J. H. Ehrehart at the northwest corner of what is now Old Cutler and Franjo Road, across the road from Franjo Park, which is the property shown on the plat as belonging to Dade County. The 1930 U. S. census enumerated residents living on the Perrine Road so the name wasn’t changed to Franjo Road until after then. In 1933, Dade County beautified the road by planting 450 Canary Island date palms on either side of the Franjo road. The palms were donated by Dr. William S. Burkhart and the project only cost the County “$600, because of Dr. Burkhart’s tree gifts and the use of convict labor for most of the work,” according to an article in The Miami News on June 11, 1933. The Tenalla Ocean Farms Corporation was incorporated earlier in 1924 by Arthur J. Gannon, an architect and builder in Miami and Dexter E. Richards, the former owner of the Bell Coal Company in Cincinnati, Ohio and a principal in the investment banking firm of Field, Richards & Co. in that city. Dexter’s first wife, Emma, who had died in 1923, was a sister of Reamy E. Field, the other principal of the company. The Miami News noted that Ehrehart had sold 1,000 acres to the principals of that corporation in an article dated March 8, 1924. He retained the 5 acres where his house was located, as shown on the plat. There was an initial burst of land sales in Tenalla Ocean Farms, but by the late 1920s, the Tenalla Ocean Farms Co. joined a long list of speculative real estate ventures that had failed as a result of the bursting of the real estate bubble that had begun as early as 1903. There are no known photographs of the Ehrehart house but one might turn up in the future. A farming community known as Franjo Farms, with a school for African-American children, existed in the area but no research has ever been done about the people who lived and worked there. The Town of Tenalla was never built and the Tenalla Ocean Farms property was later acquired by Dr. Burkhart, who owned thousands of acres of land in the northern East Glade. G. Walter Peterson, a prominent potato grower in Goulds, purchased some of Burkhart’s land and later sold it to the developers of Saga Bay. John Ehrehart later moved to Miami, where his wife Frances died in 1929. He died at the age of 79 at his home at 1020 N.W. 5th Avenue on December 17, 1934 and is buried in Little Falls, New York. It is a real tragedy that the history of South Dade has been so ignored. 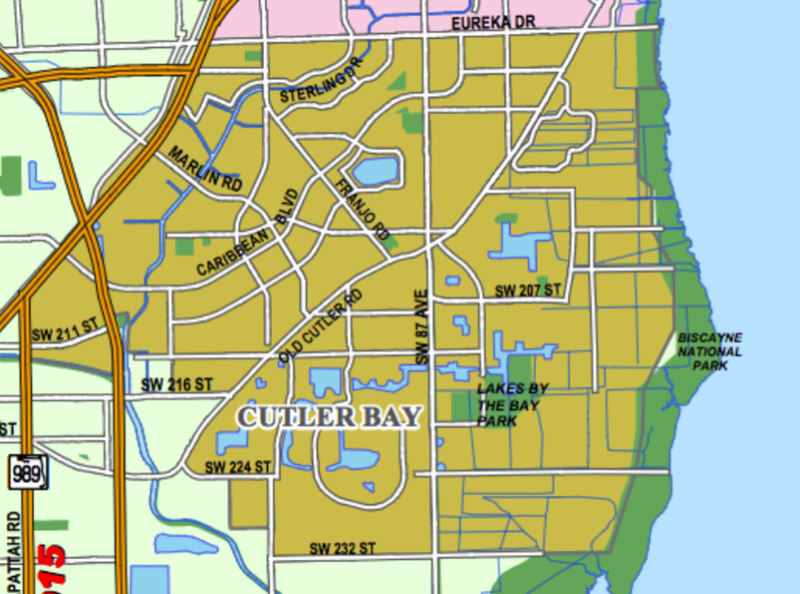 If it hadn’t been, perhaps the town of Cutler Bay would be known as Tenalla or Franjo instead.